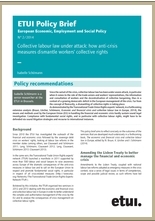 This policy brief by Isabelle Schömann (ETUI) demonstrates how the EU's financial and economic crisis has been used to attack European collective labour law. Amendments to the Lisbon Treaty, changes in the EU's economic governance and austerity measures have led to drastic national labour law reforms which undermine fundamental social rights. The role of trade unions and workers' representatives has been questioned, rules on the information and consultation of workers have been circumvented and collective bargaining has been decentralised as collective labour rights were identified as adjustment factors to counter the crisis. The paper identifies ways out of this crisis of labour law by looking at possible litigation strategies and recourse to international instances such as the European Convention of Human Rights and the International Labour organisation. It can be downloaded from the ETUI website.